Castelnaud is in an area of exceptional beauty with numerous outstandingly pretty medieval villages and castles to explore. 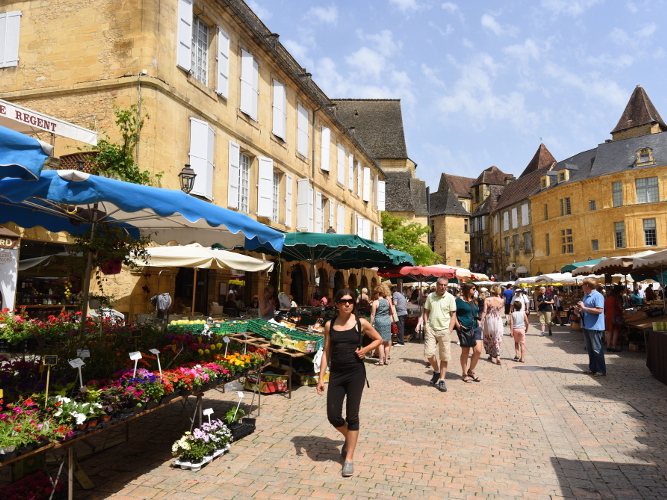 Sarlat, La Roque Gageac, Beynac and Domme are a few outstanding examples and all within just a few kms of Le Rouquet. 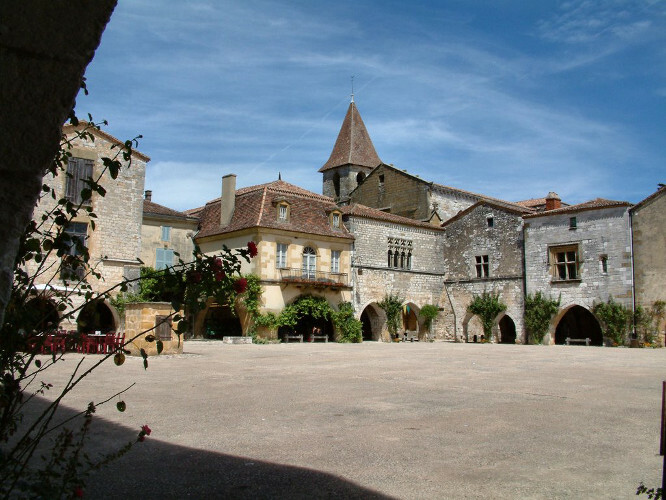 Other experiences not to be missed include visiting the local the colourful markets selling local produce, gardens, and the many prehistoric sites including the famous Lascaux caves with their wall paintings and the less commercialized ones at Abri Font de Gaume at Les Eyzies. These are some of our favourite places to visit. 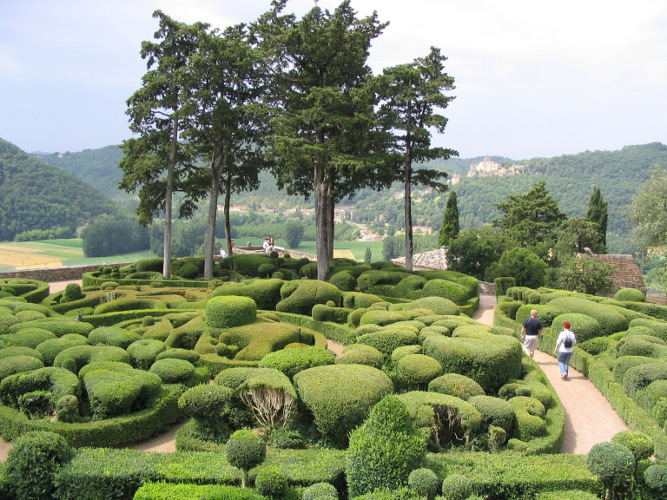 The Gardens of Marqueyssac are filled with a unique style of topiary and there are lovely woodland walks and picnic areas. The view point high above the river gives a spectacular panorama of the area. It is an easy walk from Castelnaud. The Walled Village of Domme with its fortified gateways into the town and the views over the river and the countryside below - Judy always gets very excited as we drive through the massive arched gateway into the village! The photos shows the view from the village looking downriver. 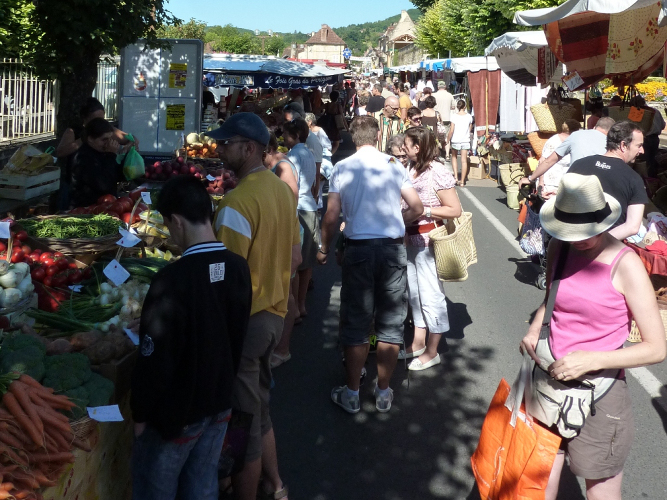 The Sunday market at St Cyprien is fun and very typical. It is also very useful for stocking up with local produce if you arrived on the Saturday. 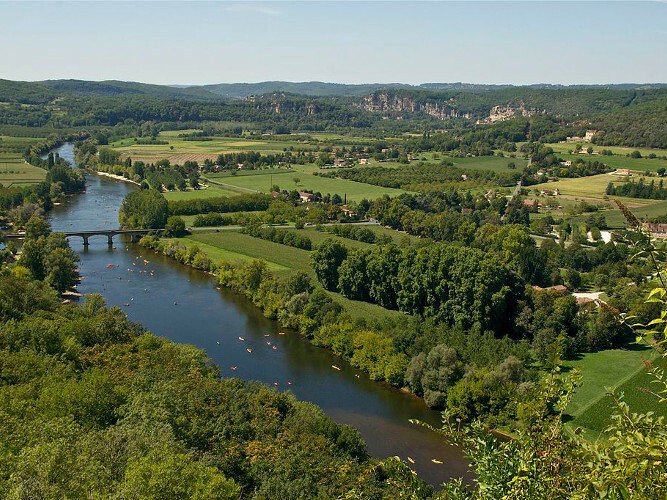 La Roque Gageac is an easy walk across the fields from Castelnaud. 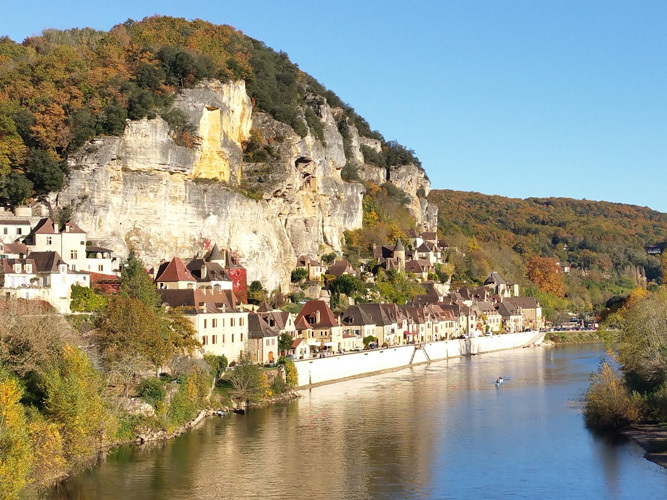 A lovely picturesque village with shops and restaurants and the boarding place for a trip on the river in a gabarre. No visit is complete without a canoe trip down the river which can be arranged from the hire office in Castelnaud by the bridge (you can choose how far you want to be taken upriver and then it is an easy paddle back to the village with the river doing most of the work and the chance to take a break at one of the riverside rest stops for refreshment and a swim). There are also many well marked walks through the wooded countryside around Castelnaud for the more energetic (maps provided in each apartment). On a hot day why not walk down to the river and enjoy a picnic on the grassy bank in the shade of the trees and cool off with a swim.